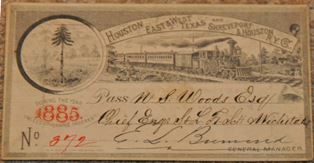 Annual (also called complimentary) railroad passes are tangible pieces of history that many railroadiana collectors love. These are popular because they are easy to date (the year is printed on them). Passes are small and easy to ship and display. Furthermore, there are virtually no fakes out there to drive down prices. Some railroad passes were issued for obscure lines that might not otherwise have any outstanding memorabilia exist from them. It is easy to understand why antique railroad passes are popular, but how do you know how much they are worth? Just like any other collectible, old railroad passes are valued based purely on supply and demand. Some passes are relatively plentiful but still sell for a few hundred dollars. Other passes are rare and obscure, but no one really follows them, so they only bring $20 to $30. Let’s talk about the factors that make one pass more valuable than another. These are the three major elements that drive the value of an old railroad pass. There is a certain nostalgia associated with railroads that ran in the Old West. If the railroad has a history that ties into a specific historic event then that also might boost the value of as pass from the same time period. Geography is also important. Passes from Colorado railroads have a very strong following. We are also seeing passes from Florida and Texas sell well right now. One railroad might have 200 people actively collecting it, while another railroad might only have 3 collectors chasing its memorabilia. Obviously the more people you can get interested in a pass, the more money it will sell for. You definitely need to pay attention to the issue year. The golden era of passes is considered 1860 to 1900. Very few passes dated after 1920 will have the chance to be worth more than a couple dollars each. This kind of ties into the time period aspect of valuing passes. Some antique railroad passes are simply small works of art and a testament to the printing standards that existed in the 19th century. Fonts, colors, and vignettes can often make a pass that would be worth $20 into a pass worth $100. The pass we are showing has virtually no color, but the train scene is well above average. It was not unusual for railroads to incorporate symbolic imagery into their passes. For example, some railroads in SC used palmetto trees and some railroads in Texas used the lone star symbol. Little stuff like that can make a pass more appealing to a wider range of collectors. Railroads usually mixed up the colors of their passes between years so it was easy to tell at a glance if the complimentary pass was still valid or expired. It is not unusual to see lots or purples, yellows, blues, reds, and oranges in addition to your traditional beige and brown colors. Well over 99% of annual passes are paper printed on a thick cardboard stock. 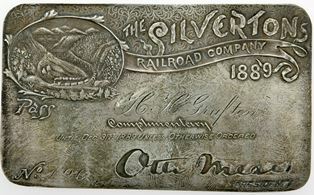 However, some rare railroad passes were made of silver and even gold. As you can imagine, if someone gave you a slab of silver or gold you probably weren’t going to throw it away. So these aren’t necessarily hard to find, but they are expensive. Some passes were more like medals that could be worn around the neck. There is a subset of collectors who focus on non-paper annual passes. The idea behind a complimentary pass was that the person who it was issued to could ride that railroad line for free for the entire year. These were typically issued to railroad employees and their family members. However, just like celebrities get special treatment today, back in the 1800s it was not unusual for figureheads outside of the company to get their own special pass. 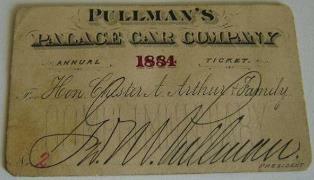 We are showing a Pullman pass that was issued to president Chester Arthur while he was in office. Something like that is going to have a more universal appeal. Just remember that the signature is not actually that of the famous person. It is signed by the person who issued the pass. From our experience there are certain “unwritten” rules that can help add a little extra value to antique railroad passes. As collectors, we like to see text that is handwritten instead of typed in. Typed text is pretty much the standard starting in 1900. Fancy cursive handwriting just adds a certain old and antique feel that is really lost when they moved to typed passes. Don’t totally discount the serial number. There is certainly a premium if you find a railroad pass that is the number one pass for that year and line. We think our guide is one of the best on the internet, but there is still no substitute for working directly with an expert. We buy and sell hundreds of passes on an annual basis. Please contact us if you are looking for an offer on your single pass or entire collection. You will find our pricing aggressive and our dealings very honest. We look forward to hearing from you.